Hand-crafted ragtime, jazz & swing — sophisticated music for adults to celebrate love — lost, found, denied or discarded. Concerts full of amusing anecdotes, memorable melodies, clever lyrics and vintage acoustic guitars. Ken Lelen sings great American ragtime, jazz & swing and performs with vintage acoustic guitars for an authentic, back-in-the day sound. from classic movies at East Greenbush Community Library. 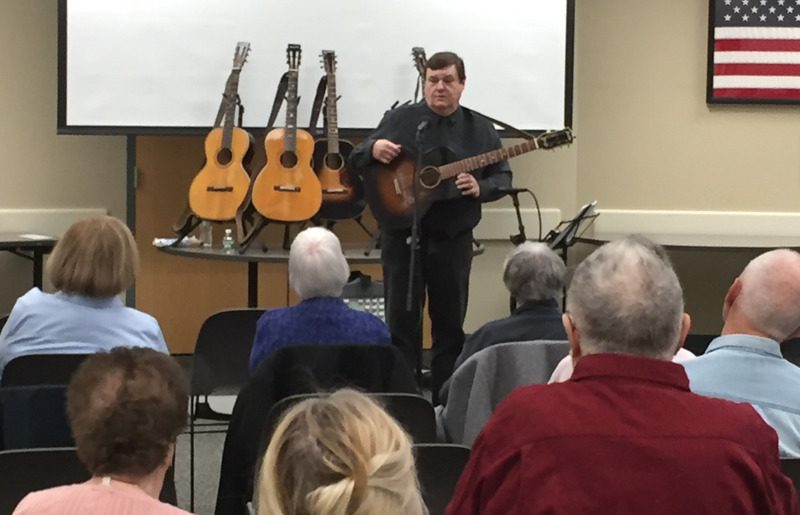 East Greenbush Community Library recently presented a Hollywood Song Souvenirs concert by vocalist and vintage guitarist Ken Lelen for its patrons and guests in the Albany NY area. 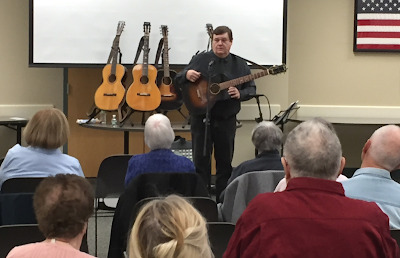 Organized by Laurie Dreyer, the facility's adult program librarian, the 90-minute concert offered nearly 20 jazz standards, romantic ballads and swing tunes to an audience of more than three dozen people. Each song in the concert had once been part of a well-known musical, comedy or drama. Eventually, for one reason or another, the songs became recorded hits, radio favorites, bandstand requests and jukebox selections once people heard and loved them. Today, some of the songs are classics in their own right, as they possess an emotional appeal for audiences beyond the realm of cinema. 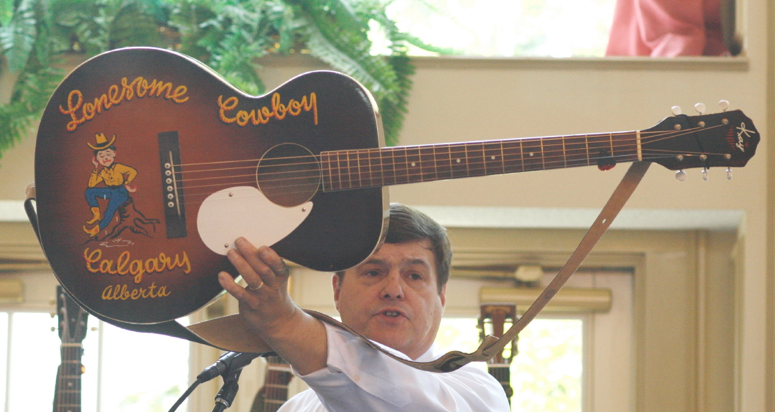 In addition to singing tunes made famous by Hollywood, Lelen played several of vintage acoustic guitars for an authentic, back-in-the-day sound. In his program Lelen offered amusing anecdotes or wry comments about the movies as well as tales about the prominent actors, story lines, composers, musicians, recording artists and vocalists for the movie songs. Here are brief descriptions of several songs performed in the Hollywood Song Souvenirs concert at East Greenbush Library. She’s Funny That Way — Told from a male point of view, this 1928 torch song by Neil Moret (music) and Richard Whiting (lyrics) was composed for use in the short film Gems of M-G-M. Popularized in 1929 by both Gene Austin and Ted Lewis, the song lingered in obscurity until recordings by Frank Sinatra, Billie Holiday and Benny Goodman hit pay dirt in the Big Band Era. Renown as a jazz standard for recording artists and performers, Hollywood film producers later turned to Billie's 1937 recording to lend emotional weight to Pollock, a 2000 biopic about abstract artist Jackson Pollock. I’m Through With Love — Toward the end of 1959's Some Like It Hot, Marilyn Monroe, in the role of lovelorn singer Sugar Kane, mounts a piano in a black slinky dress. In a tremorous full-throated whisper, she sings "I'm Thru With Love," a 1931 effort by Fud Livingston, Matty Malneck and Gus Kahn. I've watched this movie countless times. I've enjoyed seeing Marilyn Monroe as much as her co-stars, Tony Curtis and Jack Lemon, in the zany jazz-era plot. And I'll always remember the plaintive song and zaftig girl in the black slinky dress. Each time she sings the song I'm convinced she's not through with love. They Can’t Take That Away From Me — Composed by George and Ira Gershwin just months before George’s sudden death in 1937, this bittersweet song was introduced by hoofer Fred Astaire in Shall We Dance. In a fog-bound ferry-deck scene with no dance sequence, a wistful Fred sings it to his love interest Ginger Rogers. Over the next 25 years recordings by Bing Crosby, Artie Shaw, Billie Holiday, Louis Armstrong, Lester Young, Frank Sinatra and others turned this nostalgic gem into a great American standard for performers and recording artists. Most recently, the song saw featured use in 1988's Rain Man and in 1995's Mr. Holland’s Opus. Over The Rainbow — Composed by Harold Arlen with lyrics by Yip Harburg for the 1938 movie The Wizard Of Oz, this song of yearning and hope has become one of the greatest tunes in American history. In the movie the tune was sung several times by a young Judy Garland (1922 – 1969), who would reprise it for anyone and everyone — often with little hesitation — throughout her life. It Had To Be You — Composed by Isham Jones with lyricist Gus Kahn in 1924, this song became a signature go-to tune of jazz musicians and dance bands in the 1920s and 1930s. Its popularity spread with performances in no less than 13 films between 1936 and 1992, including Melody In May (1936), Casablanca (1942), I’ll See You In My Dreams (1951), Annie Hall (1977), When Harry Met Sally (1989), and A League Of Their Own (1992). Wilson) sings "As Time Goes By," in 1942's Casablanca. As Time Goes By — Written by Herman Hupfeld, the song premiered in “Everybody’s Welcome,” a musical with a three-month run on Broadway in 1931. Surpassed only by “Over The Rainbow," it is now known as the No. 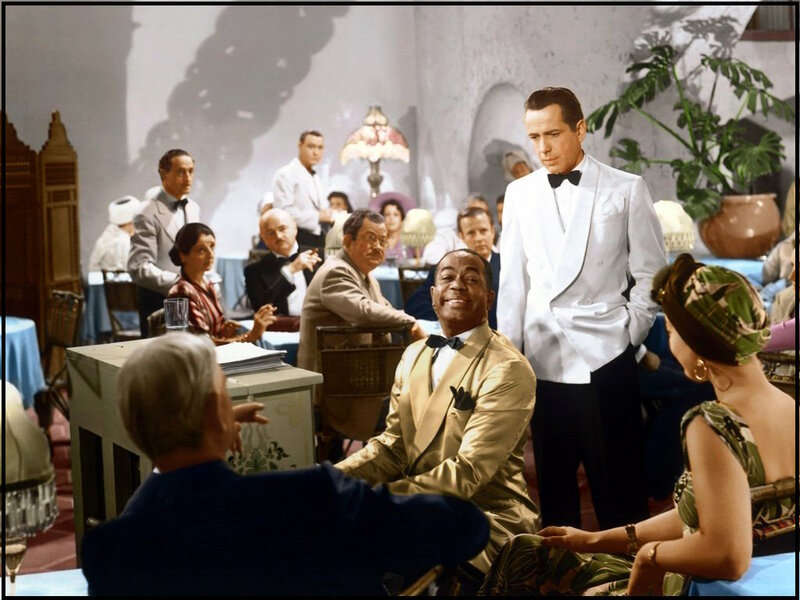 2 song in film due to its use in a scene of Casablanca. The 1942 movie, itself an ageless classic, saw Humphrey Bogart and Ingrid Bergman portray star-crossed lovers in a wartime setting. 1925 Maurer Style #493 — X-braced, mahogany-bodied auditorium guitar — made by luthiers Carl and August Larson of Chicago — original price: $30. 1933 MarvelTone — X-braced, rosewood-bodied grand concert guitar with one-of-a-kind pearl inlays in headstock and fingerboard — made by Regal Instruments of Chicago for wholesale distribution by Targ & Dinner of Chicago — original price: $50. 1934 Kalamazoo KG-11 — ladder-braced, mahogany-bodied grand concert guitar with cost-saving features and budget branding — made by Gibson of Kalamazoo MI for sale by retailers across North America — original price: $12.50. 1938 B&D Groton 1 — ladder-braced, mahogany-bodied auditorium guitar — made by Regal Instruments of Chicago for exclusive retail sale by B&D of Groton CT — original price: $15. 1939 Harmony Round-Up — recently restored and X-braced maple-body jumbo guitar with Gene Autry stenciled in the fingerboard and Round-Up stenciled in the headstock to honor the Singing Cowboy of radio, recordings and movies — made by Harmony Co. of Chicago for exclusive mail-order sale by Sears, Roebuck and Co. — original price: $9.95. smile again at the azure skies of our youth. and jazz, his effusive vocals & deft guitar work. Copyright © 2019 — Kenneth Lelen — All Rights Reserved ........................ Watermark theme. Powered by Blogger.